Bush 'Mission Accomplished' Sign: To Display Or Not Is Question : It's All Politics The Bush presidential library is considering whether to display the famous Mission Accomplished sign that was a backdrop to the former president's speech on the USS Abraham Lincoln aircraft carrier when he declared major combat over in Iraq. 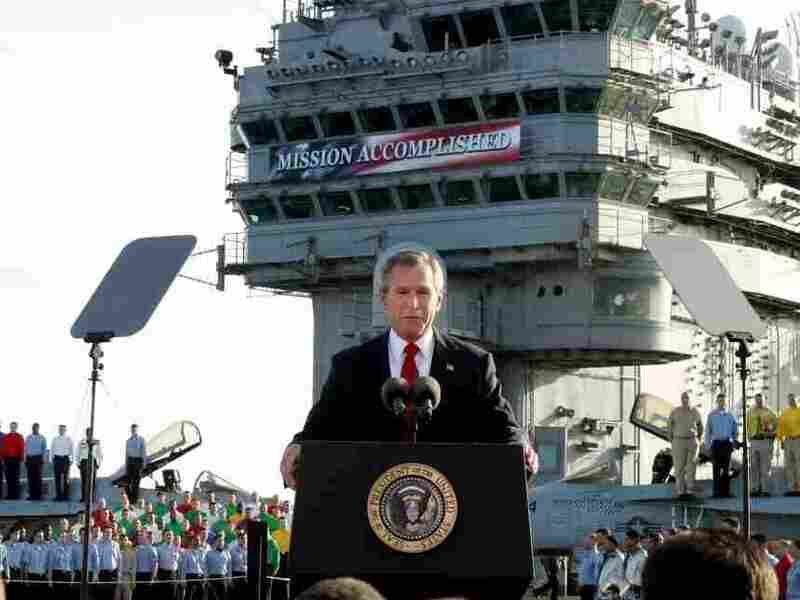 One of the most famous signs in American political history was in the news this week with the USA Today report that the relevant officials are considering whether to display the "Mission Accomplished" sign at the George W. Bush Presidential Library. A strong case can certainly be made for giving the banner a prominent place in the library. The sign, the backdrop for Bush's appearance aboard the USS Abraham Lincoln aircraft carrier in May 2003, came to symbolize the bad assumptions Bush and his national security team made about Iraq before the invasion and during the occupation. In fact, now that the word is out that the National Archives has the sign, it's hard to see how they would be able not to display it.